Right on schedule, ready to go! 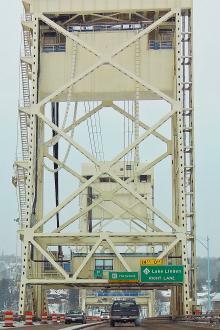 The Lift Bridge major construction work is completed. 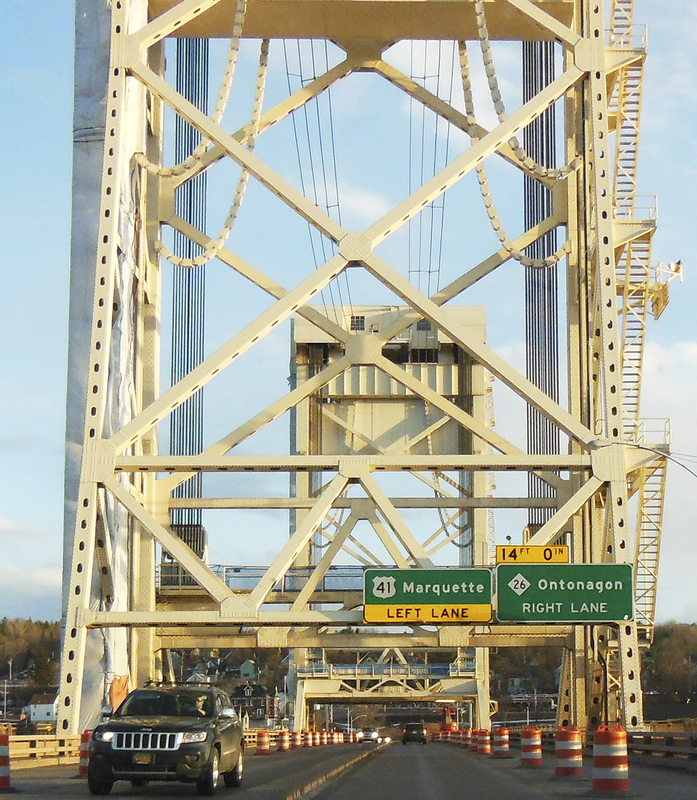 With the exception of adjustments, the Bridge is ready for the April 15th. 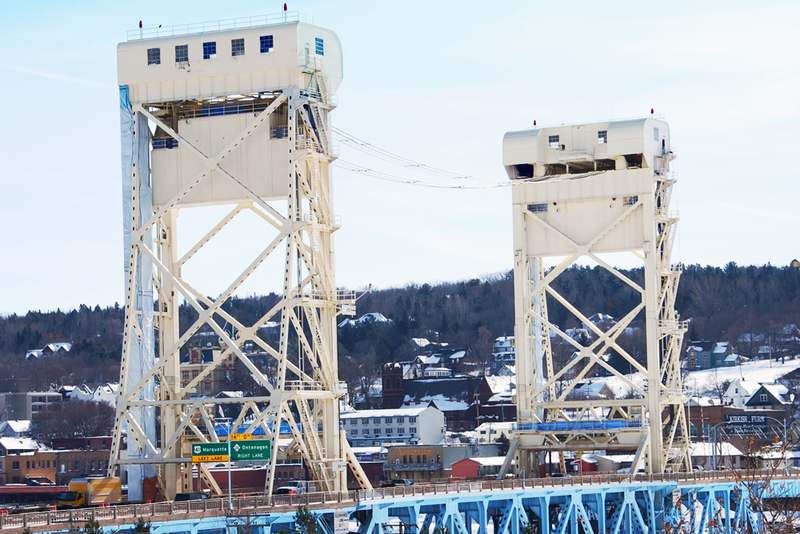 opening of the 2015 shipping season on the Keweenaw Waterway. 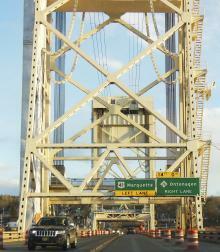 There will be some opening hours restrictions as other work continues, see the other Bridge pictorial for MDOT info. Great job by Zenith-Tech and its crews, and by MDOT. Ready to go! All major construction work is now completed. Right on schedule. All new Lift Cables, and Balance Chains are now reinstalled. 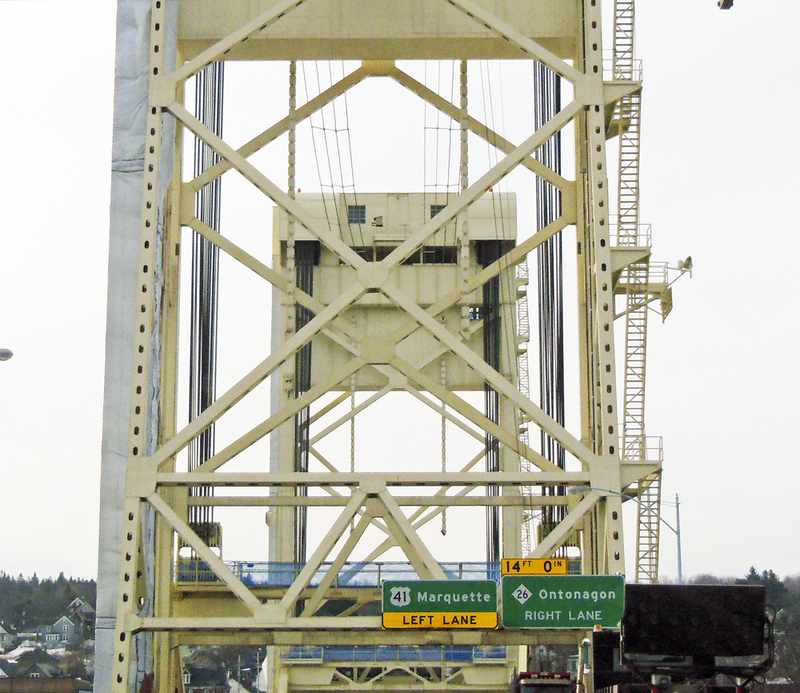 The week of March 16th saw four of the newly refurbished Balance Chains put back into place, two on each tower, ready for the second overnight closure on Sat.,March 21st , to reconnect the 82 Lift Cables back to the Center Span. The last 4 Balance Chains will be replaced in the coming weeks. 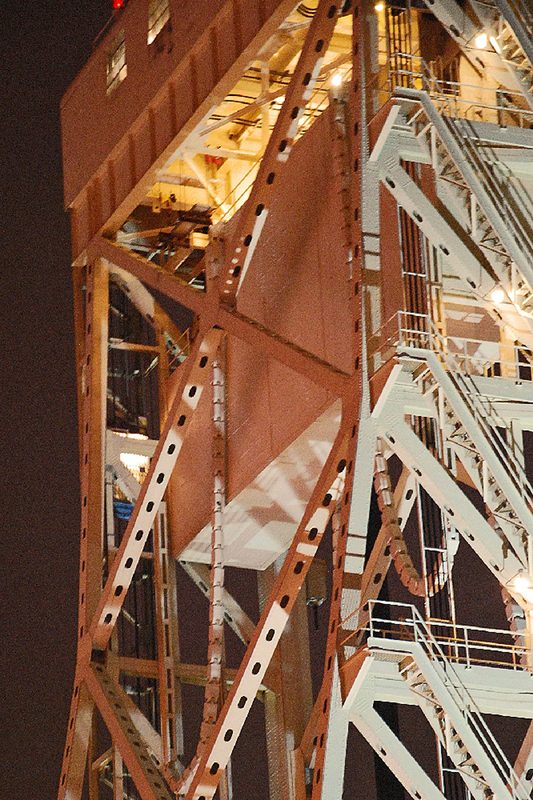 The week of March 9th brought the installation of all 82 new Lift Cables up into the towers, ready for the Saturday, March 21st all night closure work period, to connect them all to the center span of the PLLB. 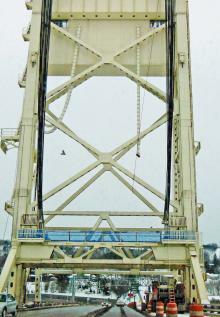 When refurbishing of the Balance Chains has been completed, they will be scheduled for remounting on the Bridge Towers. 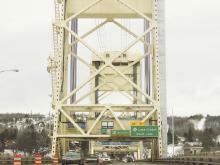 Not since 1958/59 has the Bridge been so naked. 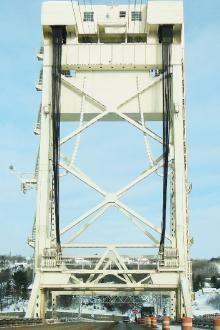 All original Lift Cables, and all Balance Chains, have now been removed. The week of March 2 will see work commence on lifting the first of the new Lift Cable assemblies into place on the Towers. 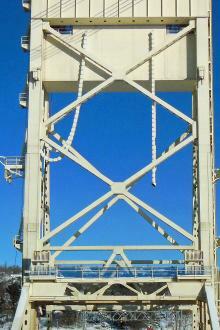 Refurbishing of the Balance Chains is continuing at Calumet. The first six (of 82 total) new Lifting Cables have arrived on the work site, ready for lifting up into the Towers in the spring. There is one cable each on a reel, with three reels arriving on each semi flat bed. 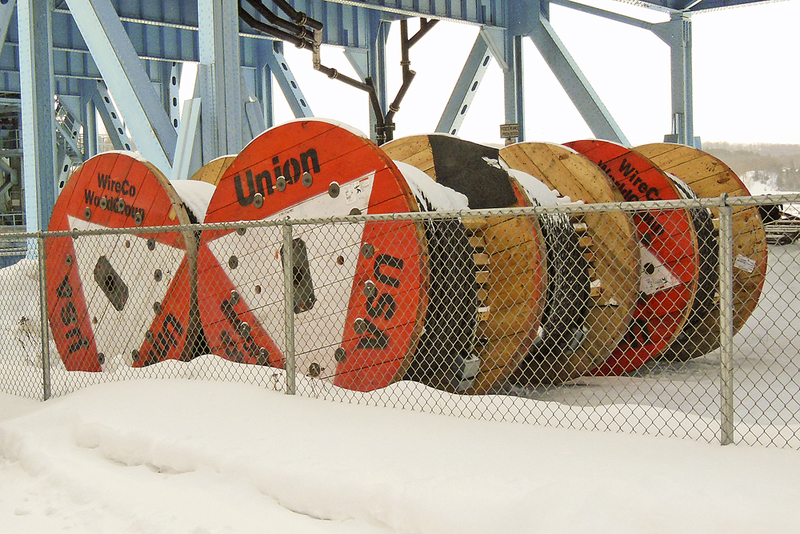 Each cable is 2 3/8" in diameter, 169'7" long. 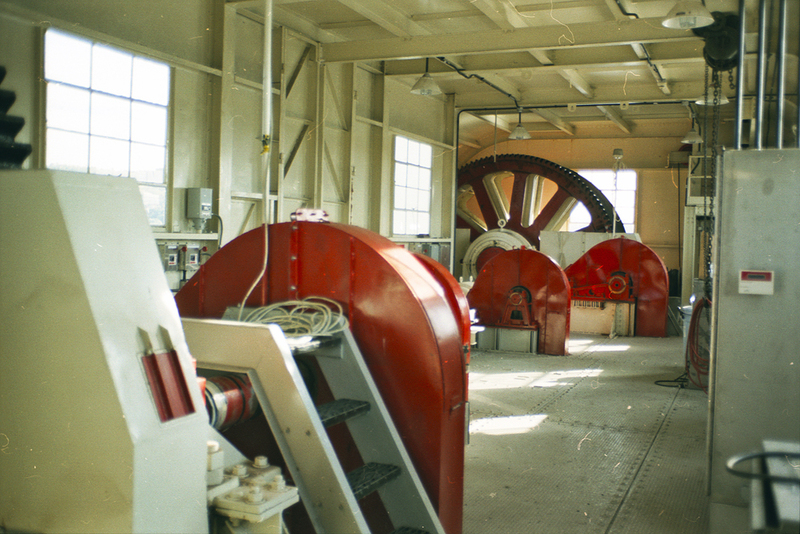 This file photo shows the S. Tower machinery room at the tower top, which is undergoing refurbishing, also the N. Tower machinery room equipment as well. 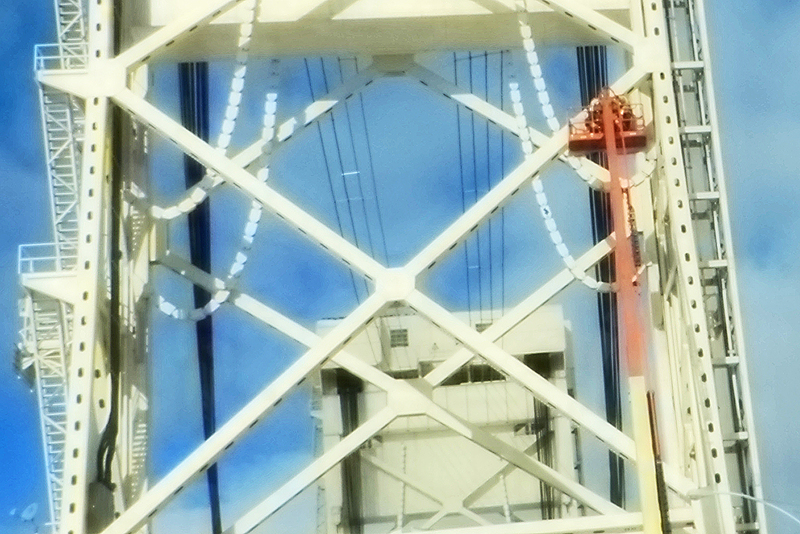 The huge gear at the back is where the lifting cables for that side of the span come up and over, then down to the counterweight below. 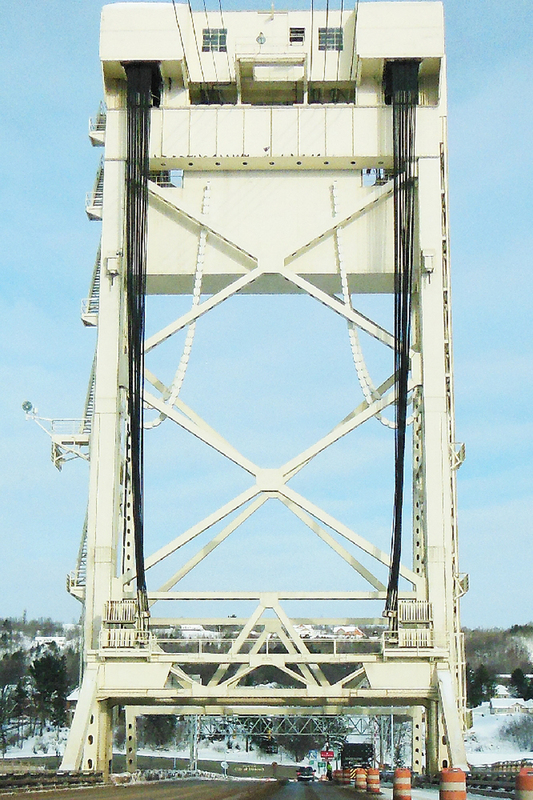 On Feb. 1t, two Balance Chains have been removed for refurbishing, one on the SE side of the South Tower, and one on the NE side of the North Tower, seen here. Also note the protective plastic housing over the upper part of he outside elevator on the right side of the Tower, that the wind has partially dislodged. 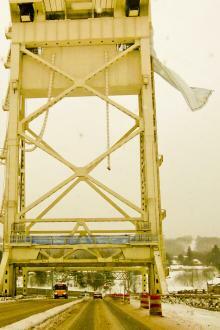 It is expected that two more Chains will be removed by the end of the week. 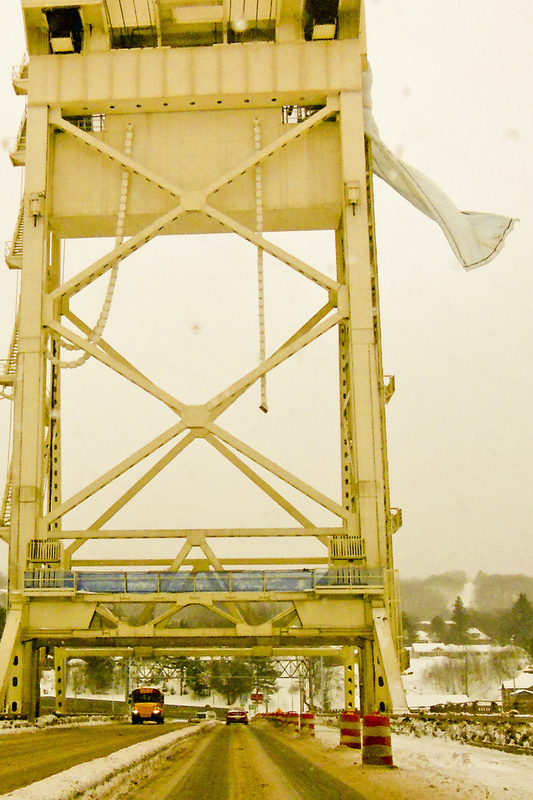 By Feb. 6th, the last of the original Lift Cables have been removed. Scheduled for the second week in February, is the removal of the Balance Chains, two of which in this photo have already been disconnected from the main towers. 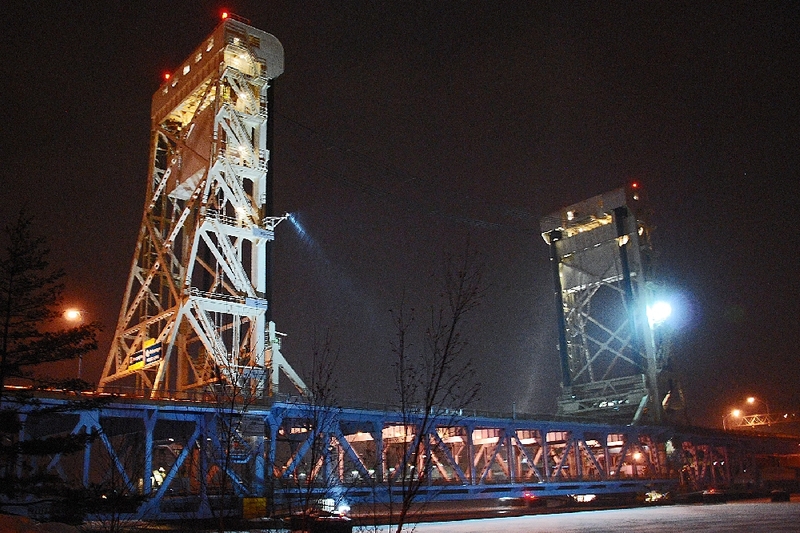 The night of Jan. 29/30 saw removal of the East side Lift Cables from both towers. 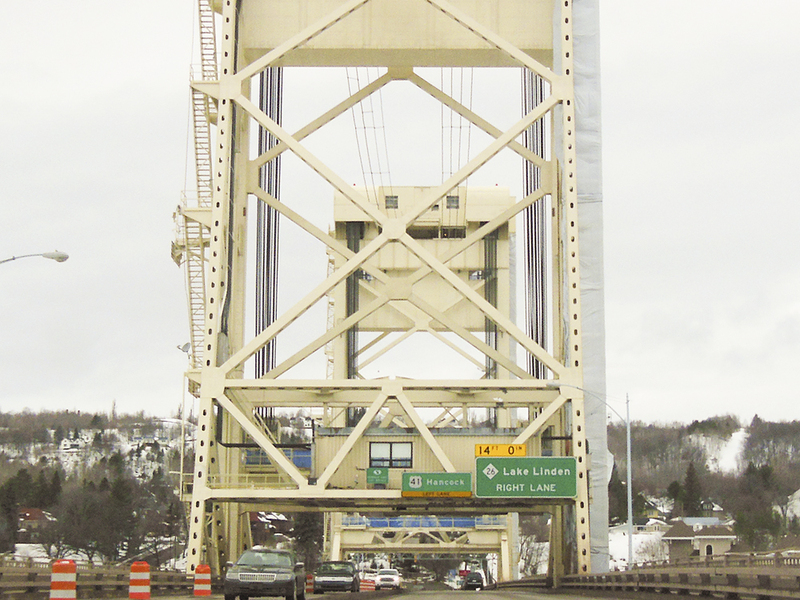 Presumably, with the change in lane closures, the west side Lift Cables may be removed by the end of January. 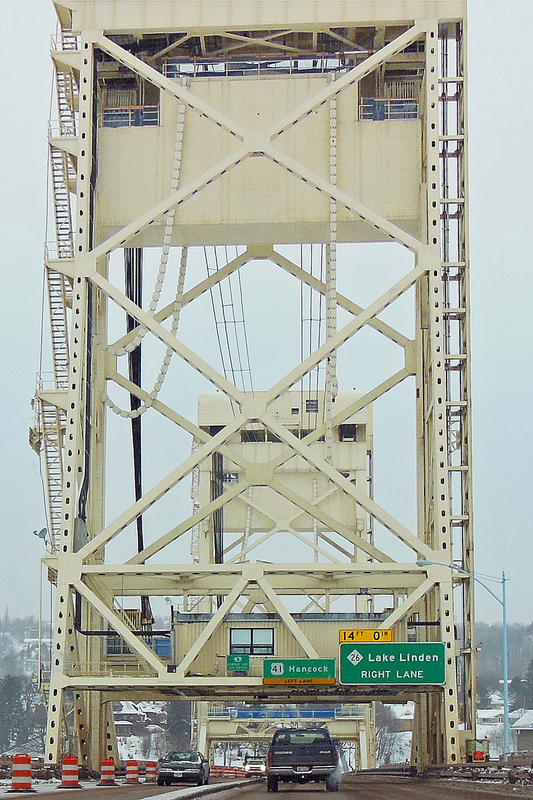 Wed.,Jan.28 found all the East side balance chains on both towers, have been disconnected from the tower framework, and appear ready to be disconnected from the counterweights and lowered, into large semitrailer units. 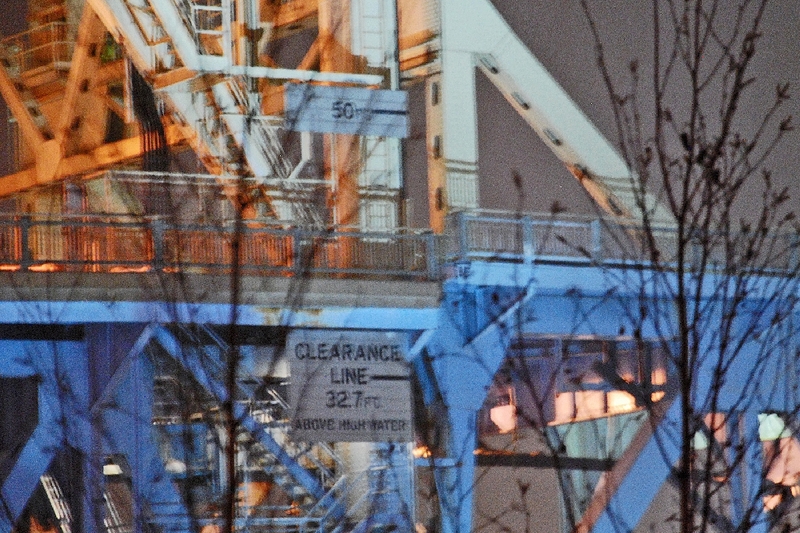 The following Tuesday found crews on the S. Tower apparently beginning work to remove the chains from the towers. Removal works will presumably take place in the over night hours. 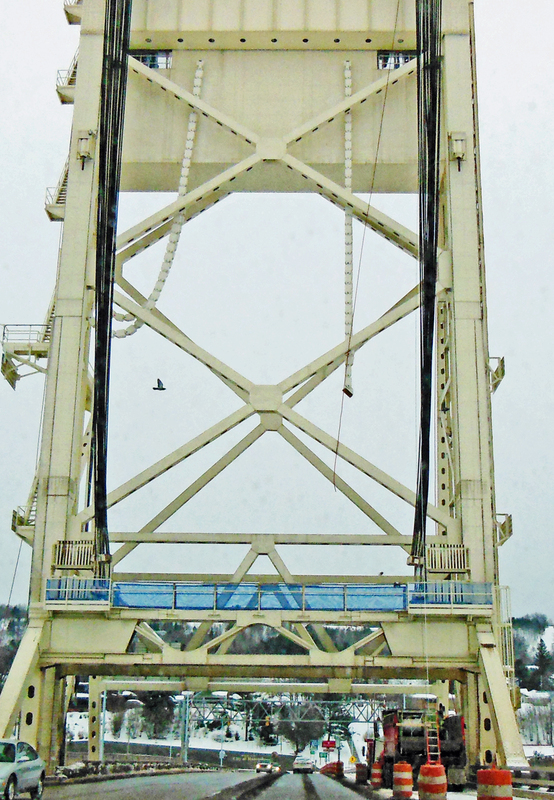 And this is the North Tower, with cables ready for removal. 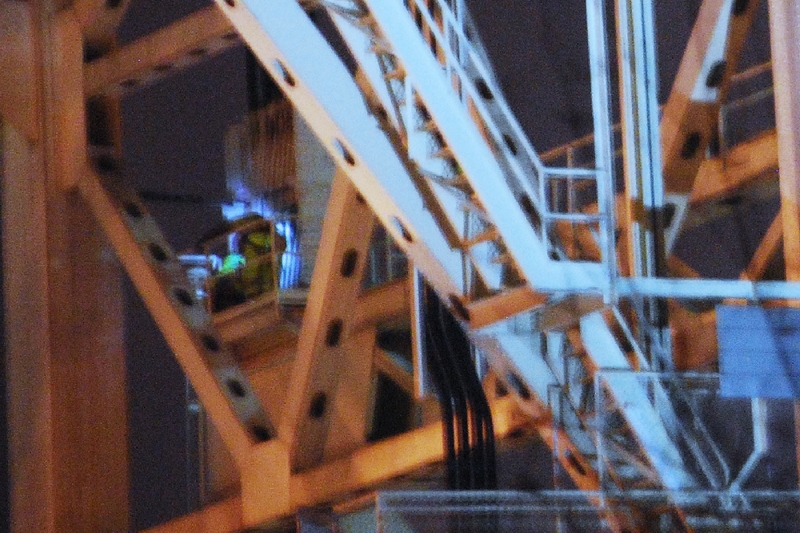 The weekend closure was a success, with the lifting cables being disconnected on both towers, as this photo shows. The next task will be to lower and remove the old cables. This is the South tower. And also on the North Tower, East side connectors. 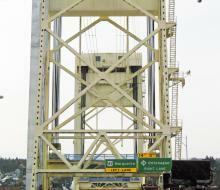 The Bridge re-opened one hour earlier than planned, at 6 am Sunday. 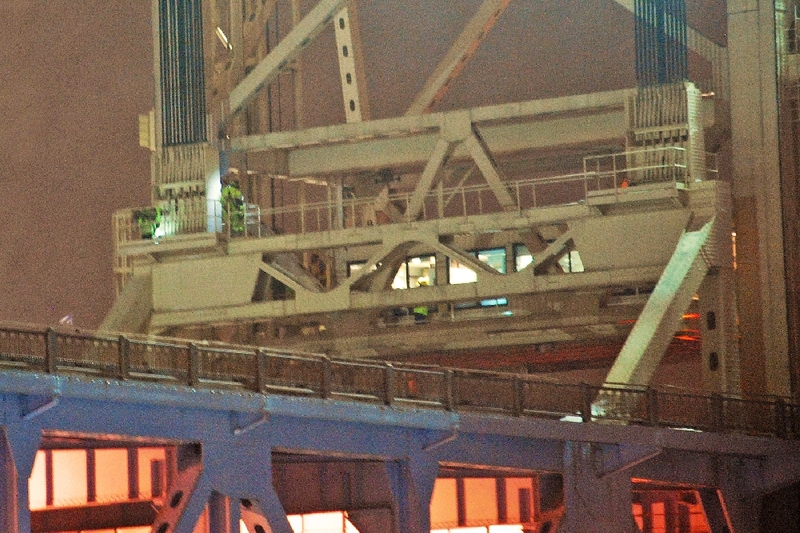 Workers (L) working on the center span cable connectors on the South Tower. 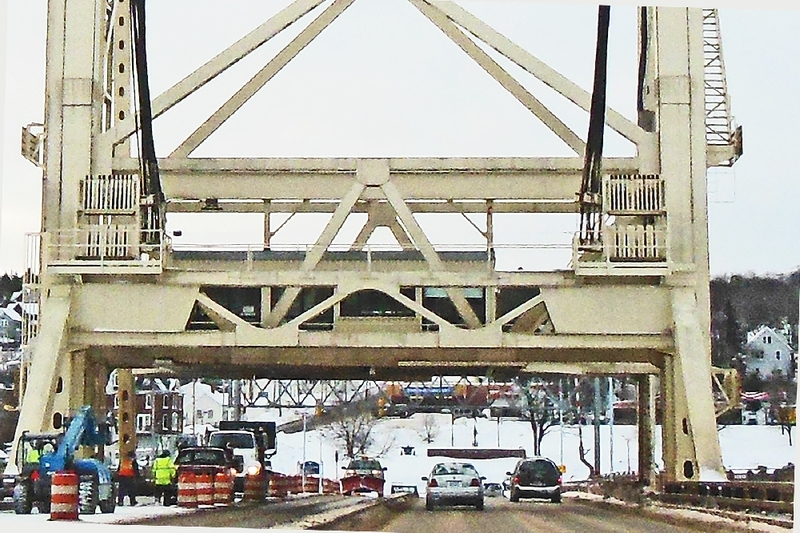 The Center span has been raised about 2 ft. With the counterweights locked, this puts slack in the lifting cables to allow their removal. The North Tower (note elevator in use, far side). 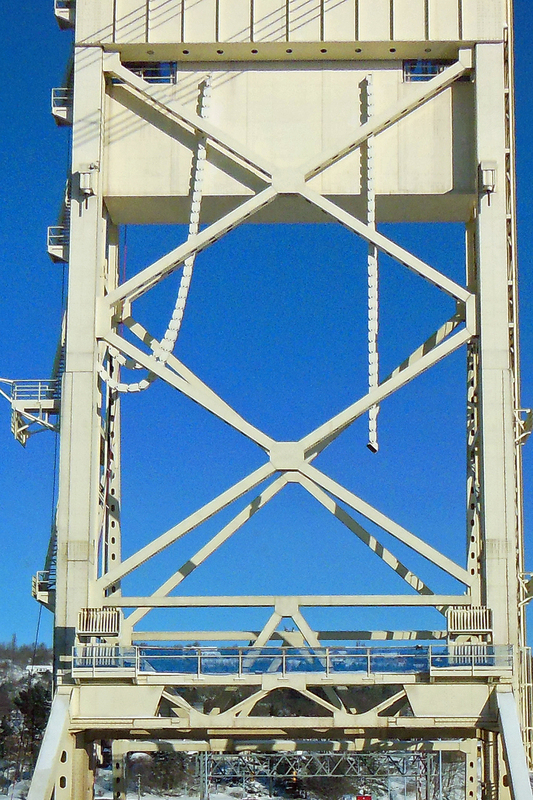 The huge counterweights have been locked in their topmost position. PLLB as it appeared about 12:30am Sunday, Jan. 18th., with work in progress and traffic stopped.